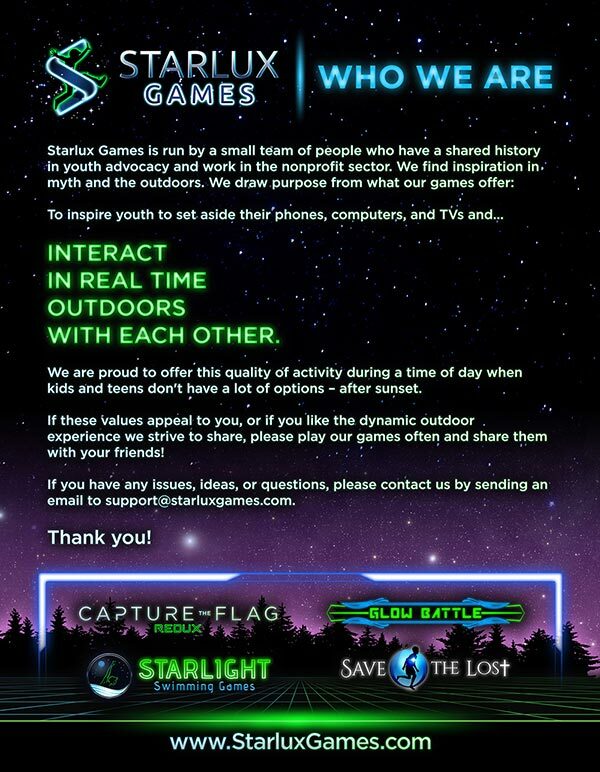 We at Starlux Games are proud to be a sponsor for Carolina For The Kids, a non-profit whose mission is to provide major emotional, medical, and financial support for the patients and families served by UNC Children’s Hospital. 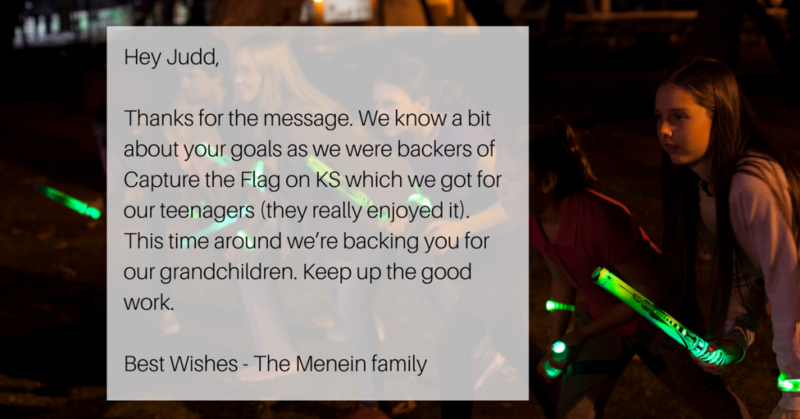 As part of our sponsorship, we donated our glow in the dark game Capture the Flag REDUX and game accessories for their UNC Dance Marathon, which was held March 23-24. “Walking out to the fields where Capture The Flag was setup was so cool. The second I saw it, I knew I wanted to play!” – Hunter M.
“It had been a long day, but playing Glow in the Dark Capture the Flag made me forget about it all!” – Jessica G.
“I grew up playing Capture the Flag in my neighbor’s yard, but Glow In The Dark Capture the Flag was a whole new spin.” – Anna E.
I just received this kind testimonial from a family who has now backed both our Capture the Flag REDUX Kicskstarter campaign and now our GLOW BATTLE Kickstarter campaign. This testimonial made my day and I wanted to share it. We are so happy to announce that we just received another great review for our new glow in the dark game, GLOW BATTLE, from Tricia Fandrey at the popular blog, The Night Owl Mama. “The whole family couldn’t wait to get their hands on these wands. Even though these aren’t the original wands used in the game that will be available in stores the concept is awesome. My boys were running all over the house with these wands and of course even though this game has rules I think they made up their own. That’s the great thing about games you can either follow the rules set up or you can put together your own rules to create a whole new fun game. Thank you Tricia for the great review! 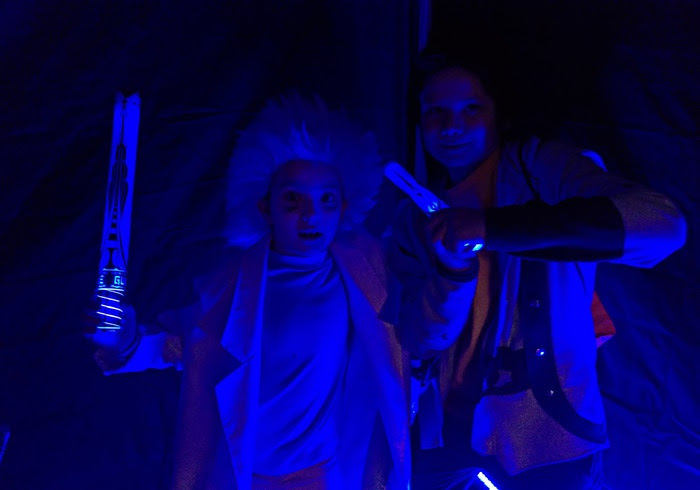 We’re so happy your family enjoyed playing GLOW BATTLE. Click here to read Tricia’s full review of GLOW BATTLE at the blog, The Night Owl Mama. If you would like to get GLOW BATTLE for your family, click here to purchase it. Here’s a fun post about how are kits get made and our upcoming capture the flag strategies guide. First off, we thought we would share a few photos from our April production run below. There are moments in the year when we briefly run out of stock. Usually because demand is too high (hellooooo Christmas) and when we have not received a new shipment due to quality control checks. However, we feel it is important that instead of rushing large orders, that we take the time to do medium batches, knowing that all the kits are complete and that production has taken the time to undergo every check point. These are small parts after all and we want to make sure the kits are safe for everyone playing. In other news, are you in the market for capture the flag strategies? We have created a FREE eBook of the ultimate Capture the Flag strategies that you can download as a pdf! We have a new system for printing our capture the flag rules: the inside of the box lid! Our all-new capture the flag box top and bottom. The production of our Capture the Flag REDUX jail lights is a long process. It happens after every birthday party or after every holiday… your kid(s) gets burnt out on the toy you spent your hard earned money on. You can probably relate to when you were a kid. Sometimes toys don’t have the staying power that you as a parent would want. It can be difficult to keep your kid interested and curious during play. For this reason, many toy companies have started to transition their products towards multi-use and multi-play items. People love options, and people want options. So how do you keep your kid engaged for longer? Offer them more options and the resources for ongoing imagination. For example, Capture the Flag REDUX comes with game variation cards. With school almost out, many parents have been searching for fun summer games for their children, something to engage their kids. Something to keep them going all summer long. With these variation cards, your kids will not only be able to play the standard Capture the Flag game, but will also be playing up to 12 different game variations! Each game variation gives you a new and entertaining way to play outdoors with friends and with family. It has been a top seller of fun summer games for the past few years and for good reason. Some variations include role playing parts, such as “Werewolf.” In this one, some kids pretend to be wolves by howling and “scratching” (technically, touching) others, who turn into werewolves, as everyone else searches for the “antidote” (orb). Not only do these cards introduce new forms of play, but they also ignite the imagination of your kids and neighborhood. We have had numerous players send in their own game variations that they created with the kit. 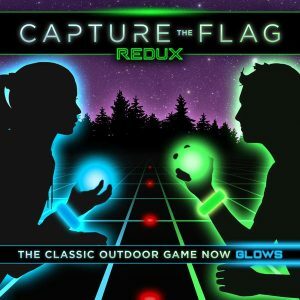 So if you’re looking for a fun summer glow in the dark game that will engage your kids longer, then consider Capture the Flag REDUX.